Good morning, and Happy Saturday, everyone! I hope you had a great Thanksgiving. I ate my weight in dressing and then ate too much pie and too many oatmeal cookies. I may or may not have had pie for breakfast yesterday morning, and I may or may not be eating an oatmeal cookie while I write this post. 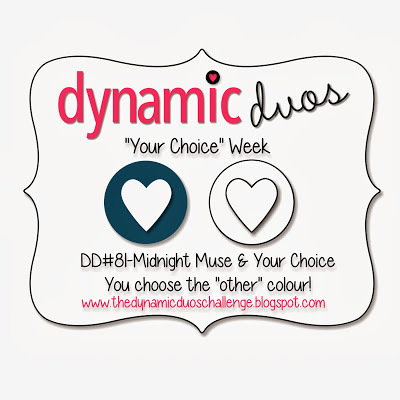 This week at Dynamic Duos, it’s Your Choice week! The challenge is to use Midnight Muse, and you choose the other color (plus neutrals). I chose Pistachio Pudding, though it looks more like Pear Pizzazz in the photo. I’ve actually never made a shaker card before, and I was really pleased with how this one turned out. The snowflakes are all cut using the Festive Flurry framelits, and the Pistachio Pudding snowflakes are stamped using the Festive Flurry stamp set. To make the shaker snowflake, I first stamped the smallest snowflake in Midnight Muse, then in Pistachio pudding. I cut out both images with the smallest framelit, then also cut a snowflake out of a Window Sheet using the same framelit. I punched a 3/4″ Circle out of the center of the Pistachio snowflake, then glued the Window Sheet snowflake to the back of the Pistachio Pudding snowflake using Crystal Effects. After sticking a Rhinestone to the center of the Midnight snowflake, I adhered a Shaker Frame to the top of the same snowflake, then added some Silver Glass Stampin’ Glitter inside the frame. Then I adhered the Pistachio/Window snowflake on top of the Shaker Frame. I started with a 5-1/2″ x 4-1/4″ card base but then cut off 1-1/4″ or so because I wanted the snowflakes to hang off the edge of the card. Before I glued down the large snowflake, I embossed the base using the Northern Flurry embossing folder. I put Dimensionals between each snowflake layer, but I used tape runner on the back of the largest snowflake and then on the back of the shaker snowflake since it already had a lot of dimension from the use of the Shaker Frame. The greeting is from Christmas Messages. I love this stamp! I used the Midnight Muse 3/8″ Stitched Satin Ribbon to make the bow, and before I pulled my knot tight, I slipped a short length of the Pistachio Pudding Ruffle Stretch Trim into the back side of the bow. I glue-dotted the bow onto the card, then added several Rhinestones to finish off the card. 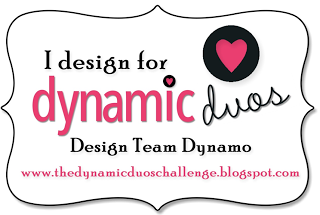 I hope you like the card and will join us at Dynamic Duos. We’d love to see your take on the challenge! Midnight Muse goes well with so many colors. 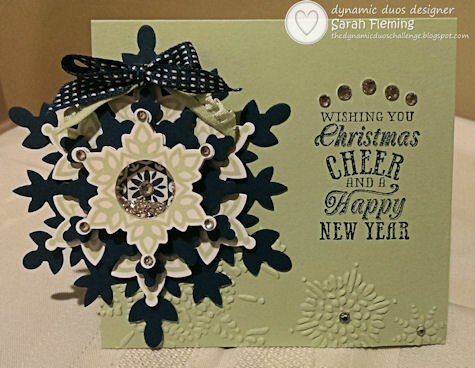 Head on over to the challenge blog to see the other designers’ fabulous cards!